The 2015 Toyota Owners 400 was a NASCAR Sprint Cup Series race held at Richmond International Raceway in Richmond, Virginia. It was scheduled to be held on April 25, 2015, but was run on April 26, 2015 due to rain. Contested over 400 laps on the 0.75 mile (1.2 km) D-shaped short track, it was the ninth race of the 2015 NASCAR Sprint Cup season. Kurt Busch won the race, his first of the season, while teammate Kevin Harvick finished runner-up. Jimmie Johnson, Jamie McMurray and Joey Logano rounded out the top five. Joey Logano won the pole for the race. He led 94 laps on his way to a fifth-place finish. Kurt Busch led a race high of 291 laps. The race had twelve lead changes among five different drivers, as well as eight caution flag periods for 53 laps. This was the 26th career victory for Kurt Busch, second at Richmond International Raceway and first at the track for Stewart-Haas Racing. The win moved Busch up to 18th in the points standings. Chevrolet left Richmond with a 29-point lead over Ford in the manufacturer standings. The Toyota Owners 400 was carried by Fox Sports on the broadcast Fox network for the American television audience. The radio broadcast for the race was carried by the Motor Racing Network and Sirius XM NASCAR Radio. Richmond International Raceway (RIR) is a 3/4-mile (1.2 km), D-shaped, asphalt race track located just outside Richmond, Virginia in Henrico County. It hosts the NASCAR Sprint Cup Series and Xfinity Series. "America's Premier Short Track" formerly hosted a NASCAR Camping World Truck Series race, a Verizon IndyCar Series race, and two USAC sprint car races. Kevin Harvick entered Richmond with a 30-point lead over Joey Logano. Martin Truex Jr. entered 33 back. Jimmie Johnson entered 56 back. Brad Keselowski entered 59 back. Following an incident from last year's Federated Auto Parts 400, Richmond International Raceway has added metal barriers and more security personnel to prevent fans from scaling the catch fence during the race. With 71 laps to go in last September's race, a man identified as James Dennis climbed to the top of the catch fence overhead of turn 4. This forced David Hoots, competition director for the Sprint Cup Series, to put the race under caution. "It's frustrating and unfortunate," Dennis Bickmeier, track president of Richmond, said Friday. "I was very adamant after hearing about it that fans don't do that. A fan doesn't disrupt an event. You respect it." The entry list for the Toyota Owners 400 was released on Monday, April 20, 2015 at 11:23 a.m. Eastern time. Forty-five cars were entered for the race. Chase Elliott attempted to make his second career Sprint Cup Series start in the No. 25 Hendrick Motorsports Chevrolet. Ron Hornaday Jr. was on the initial entry list, but The Motorsports Group decided to replace him in the No. 30 Chevrolet, which was driven by Jeff Green who attempted to make his first start since the 2011 Lenox Industrial Tools 301 at New Hampshire Motor Speedway. Reed Sorenson drove the No. 34 Front Row Motorsports Ford that had been driven by Chris Buescher. Brad Keselowski was the fastest in the first practice session with a time of 21.414 and a speed of 126.086 mph (202.916 km/h). Kasey Kahne was the fastest in the final practice session with a time of 21.368 and a speed of 126.357 mph (203.352 km/h). Joey Logano, seen here at the 2015 Daytona 500, won the pole for the Toyota Owners 400. Joey Logano won the pole with a time of 21.248 and a speed of 127.071 mph (204.501 km/h). “The guys did a great job getting us faster today,” Logano said. “It is fun because you go out and run all these laps and that lap didn’t even actually feel that good because you have seven or eight laps on your tires and the car is sliding around a lot so it is funny that the pole sitting car is sliding all over the place but everyone is on old tires out there.” Denny Hamlin, who got out of the car last week at Bristol because of neck spasms, qualified second. “I’m 100 percent fore sure,” the Joe Gibbs Racing driver said. “I would have liked the pole but I am definitely happy for Joey to see him get it,” Brad Keselowski said of his teammate being on the pole. “It is nice for Team Penske and great for Ford. If you can’t get a pole you want it to be your teammate so I am happy that he was able to get it done.” Jeb Burton and Brendan Gaughan failed to qualify for the race. Just before the race, BK Racing announced that Burton will drive the No. 23 car in place of teammate J. J. Yeley. Because of the driver change, Jeb Burton started the race from the rear of the field. The race was scheduled to start at 7:14 p.m. Eastern time, but the threat of bad weather moved the start up to 7:05 p.m. It was all for naught, however. NASCAR made the decision to postpone the race to Sunday at 1:16 p.m. The race started at 1:19 p.m. with Joey Logano leading the field to the green flag. With all the rubber being washed away by the rain, the cars were primarily running the bottom groove. Coming out of turn 4 on lap 4, Danica Patrick got hit by Casey Mears and about spun out. She saved the car and the race remained green. Logano caught the end of the field ten laps into the race. By lap 21, Kurt Busch began reeling in the leader. By lap 42, Busch, his teammate Kevin Harvick, and Martin Truex Jr. pulled within a second of Logano. The first caution of the day flew on lap 51. This was a planned competition caution for overnight rain. The top ten in the running order entering pit road would've remained the same exiting, but Jamie McMurray, who was running eighth, had to make another pit stop for loose lug nuts. He restarted the race in 30th position. The race restarted on lap 57. After 40 laps, Busch pulled up to the leader. Using the lapped car of Josh Wise as a pick, Busch passed to the inside of Logano to take the lead on lap 96. The second caution flew on lap 124 when Joey Gase, coming off turn 2, got turned by Aric Almirola and hit inside backstretch wall head-on. Busch swapped the lead with Harvick on pit road with his teammate pitting before the start/finish line. Busch, however, exited pit road with the lead. The race restarted on lap 137. The third caution flew the next lap for Wise's car had stalled at the exit of pit road. The race restarted on lap 144. The fourth caution race flew on lap 163 when Wise blew an engine. Having just rejoined the race, his No. 98 Ford went up in smoke while going into turn 1. Busch swapped the lead with Harvick on pit road. This time, however, it was Harvick who exited with the lead. The race restarted on lap 171 and Busch immediately took back the lead. The race went through a long green flag run with everyone settling into a rhythm. McMurray, who restarted the race earlier in 30th, eventually ran Busch down. and took the lead on lap 260. He gave it back to Busch the next lap and took it back the lap after that. While McMurrary and Busch fought for the lead, many cars began hitting pit road. McMurray gave up the lead to pit on lap 266 and gave it to Brad Keselowski. Brett Moffitt had a tire going flat and slammed the wall in turn 1. This brought out the 5th caution on lap 270. Trevor Bayne also had a tire going flat and hit the wall in turn 4. To add insult to injury for Moffitt, he was forced to restart the race from the tail-end of the field for having too many men over the wall. Fifteen cars took the waive-around, most of whom were cars running in the top ten when the caution came out. Kurt Busch, seen here in 2012, scored his 26th career win at Richmond. The race restarted on lap 279 with Busch still in the lead. After a nearly 60 lap green run, debris in turn 3 brought out the sixth caution of the race with 50 laps to go. Kurt Busch exited pit road first to maintain the lead. Jeb Burton was forced to drop to the tail-end of the field for an uncontrolled tire. The race restarted with 42 laps to go. The seventh caution of the race flew with 41 laps to go when Tony Stewart went spinning on the front stretch. Coming to the line, Stewart made contact with Dale Earnhardt Jr., went spinning and made contact with the inside pit wall towards turn 1. “I don’t know," Dale said after the race. "You’ll have to ask him. He hit me in the left-rear quarter panel. I was trying to clear the 51 on the outside of me, so I was as high as I could go. You’ll have to ask him.” "I mean, he hit me right here. I ain't got that good of a peripheral vision. Pretty good, but not that good. Well, it's never his fault. I was doing everything I needed to do. I didn't drive under, I didn't drive into him, I didn't move my line at all. He's gotta take a little ownership in what happened there." The race restarted with 33 laps to go and caution flew for the eighth time when Jeb Burton got turned on the backstretch. He was rear-ended by Sam Hornish Jr. exiting turn 2. The race restarted with 26 laps to go and Kurt Busch drove off scoring the 26th victory of his career. Fox Sports covered their 15th race at Richmond International Raceway. Mike Joy, Larry McReynolds and six-time Richmond winner Darrell Waltrip had the call in the booth for the race. Jamie Little, Chris Neville and Matt Yocum handled the pit road duties for the television side. MRN had the radio call for the race, which was simulcast on Sirius XM NASCAR Radio. Joe Moore and Jeff Striegle called the race in the booth when the field was racing down the front stretch. Mike Bagley called the race from a platform inside of turn 3 on the backstretch when the field was racing down the backstretch. Alex Hayden, Winston Kelley and Steve Post worked pit road for MRN. Kevin Harvick left Richmond with a 33-point lead over Joey Logano. ^ Cole Whitt started from the rear for a post-qualifying transmission change. ^ Jeff Green started from the rear for changing engines. ^ Jeb Burton, who failed to qualify in the No. 26, drove the No. 23 in place of teammate J. J. Yeley. Because of the driver change, Burton started from the rear. ^ "2015 NASCAR Schedule" (PDF). NASCAR.com. NASCAR Media Group, LLC. August 26, 2014. Retrieved April 22, 2015. 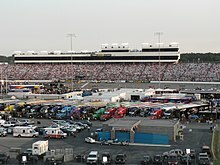 ^ "Richmond International Raceway". NASCAR.com. NASCAR Media Group, LLC. January 3, 2013. Retrieved April 22, 2015. ^ "Entry List". MRN.com. Motor Racing Network. April 20, 2015. Retrieved April 22, 2015. ^ "First Practice Results". MRN.com. Motor Racing Network. April 24, 2015. Retrieved April 24, 2015. ^ "Final Practice Results". MRN.com. Motor Racing Network. April 24, 2015. Retrieved April 24, 2015. ^ "Qualifying Results". MRN.com. Motor Racing Network. April 24, 2015. Retrieved April 24, 2015. ^ "Starting Lineup". MRN.com. Motor Racing Network. April 24, 2015. Retrieved April 26, 2015. ^ "Toyota Owners 400 Results". MRN.com. Motor Racing Network. April 26, 2015. Retrieved April 26, 2015. ^ "Points standings" (PDF). Jayski.com. NASCAR Statistics. April 26, 2015. Retrieved April 26, 2015. ^ "Manufacturer standings" (PDF). Jayski.com. NASCAR Integrated Markerting Communications. April 27, 2015. Retrieved April 27, 2015. ^ Paulsen (April 27, 2015). "Overnights Up For Postponed NASCAR From Richmond". SportsMediaWatch.com. Sports Media Watch. Retrieved April 28, 2015. ^ a b Paulsen (May 1, 2015). "Ratings Flat, Viewership Down, For PPD NASCAR From Richmond". SportsMediaWatch.com. Sports Media Watch. Retrieved May 2, 2015. ^ a b c d Hembree, Mike (April 24, 2015). "Richmond track makes safety changes after fence climber". USA Today. Richmond, Virginia: Gannett Satellite Information Network, Inc. Retrieved April 24, 2015. ^ Bonkowski, Jerry (April 24, 2015). "Keselowski, Earnhardt, Harvick fastest in first of two Sprint Cup practices at Richmond". nascartalk.nbcsports.com. NBC Sports. Retrieved April 24, 2015. ^ Bonkowski, Jerry (April 24, 2015). "Kasey Kahne is fastest in final Sprint Cup practice at Richmond". nascartalk.nbcsports.com. NBC Sports. Retrieved April 24, 2015. ^ a b c d e f Pistone, Pete (April 24, 2015). "Richmond Pole Belongs to Logano". MRN.com. Richmond, Virginia: Motor Racing Network. Retrieved April 24, 2015. ^ a b "Jeb Burton to drive for JJ Yeley in NASCAR Sprint Cup race at Richmond". nascartalk.nbcsports.com. NBC Sports. April 25, 2015. Retrieved April 25, 2015. ^ Pistone, Pete (April 25, 2015). "Rain Postpones Richmond Race". MRN.com. Richmond, Virginia: Motor Racing Network. Retrieved April 25, 2015. ^ a b c d e f g "2015 Toyota Owners 400". Sprint Cup Series. Season 67. Richmond, Virginia. April 26, 2015. Event occurs at 1:19 p.m. Fox Sports. Fox. Retrieved July 18, 2015. ^ Bonkowski, Jerry (April 26, 2015). "Kurt Busch is halfway leader in rescheduled race at Richmond". nascartalk.nbcsports.com. NBC Sports. Retrieved April 26, 2015. ^ Bonkowski, Jerry (April 26, 2015). "Kurt Busch dominates to win rain-rescheduled race at Richmond". nascartalk.nbcsports.com. NBC Sports. Retrieved April 26, 2015. ^ Gluck, Jeff (April 26, 2015). "Tony Stewart upset with Dale Earnhardt Jr. after wreck". USA Today. Richmond, Virginia: Gannett Satellite Information Network, Inc. Retrieved April 26, 2015. ^ a b Pistone, Pete (April 26, 2015). "Richmond All Kurt Busch". MRN.com. Richmond, Virginia: Motor Racing Network. Archived from the original on 2015-04-27. Retrieved April 26, 2015.